The all-new Body by Jake Cardio Cruiser is an entirely new kind of cardio workout machine designed to put you in your fat-burning ‘cruising zone’, while also giving you an energizing total body-toning workout—at the same time! 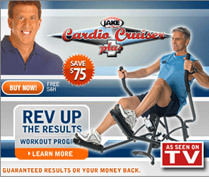 The Cardio Cruiser has a revolutionary design that combines the powerful cardio and body sculpting movements of three of the most popular gym machines. You get the comfort of the recumbent bike, the upper body toning motion of the elliptical machine, and the lower body action of the stair mill… All in one supercharged machine!